The Avatar Returns episode 30 is available for listening or download right here and on iTunes here. Six months later…we rejoin our regularly scheduled Avatar universe, already in progress. The Legend of Korra Book Two kicks off with a gurgle as angry squid spirits drag unsuspecting sailors to their watery graves, Korra has finally “mastered” airbending, and Mako does his best Horatio Caine impression. Chapters 201 and 202 introduce us to Korra’s uncle Unalaq, who is boring but apparently important, and Varrick, who’s just plain smarmy fun. 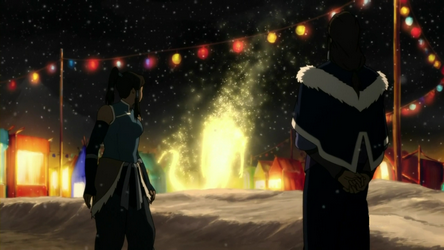 Oh, and there’s a whole spirit portal thing the Avatar has to deal with, but really we just like Varrick. Then in chapters 203 and 204, it’s civil war all over again as boring-but-bad Unalaq leads the Northern Water Tribe in a bid to “save” their Southern Water Tribe cousins. We learn more about Tenzin’s family, including his hippie chick sister Kya, and his wild and crazy older brother Bumi. The hosts agree, Bumi 2.0 is a big improvement over King Bumi. Also, Arlo reveals he’s had an Eska or two in his past, and Battle Athletes Victory wins the prize for most obscure anime reference on the podcast yet. Congratulations! Next: Book Two continues with chapters 205, “Peacekeepers,” and 206, “The Sting.” Starring Robert Redford and Paul Newman. This entry was posted in The Avatar Returns and tagged action, adventure, animation, anime, avatar, avatar the last airbender, battle athletes victory, cartoons, comedy, fantasy, itunes, libsyn, nickelodeon, podcast, television, the avatar returns, the legend of korra, tv. Bookmark the permalink.